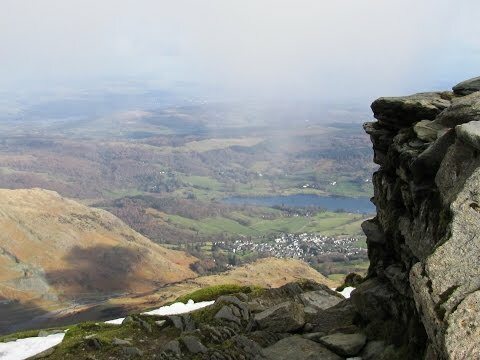 Coniston is a lovely little village close to the northern end of Coniston Water in the Furness area of Cumbria and are located in the southern part of the Lake District National Park and also within the boundaries of Lancashire. The village consists of the Ruskin Museum, a Tourist Information Centre, a variety of shops, post office, spar shop, cafes, tea rooms and four pubs The Sun, The Crown Inn, The Yewdale Hotel and The Black Bull Inn and Hotel. There are also two Youth Hostels one on the edge of the village and the other in the nearby Coppermines Valley. Coniston is and grew as both a farming community and to serve local copper and slate mines. It was a scattered rural community until the copper mines, dating from Jacobean times, were revitalised about 1859. The village grew mainly around Coniston Hall, a 16th century farmhouse with massive chimneys, built by the Fleming family which is now owned by the National Trust. Two of Coniston’s volcanic slate quarries are still operating one in Coppermines Valley being blue slate and the other at Bursting Stone on the east side of the Old Man of Coniston being light green slate. In the Victorian times Coniston became popular with tourists partly due to the construction of a branch of the Furness Railway which opened to passengers in 1859 and terminated at Coniston railway station. The creation of the national park in the 1950’s provided a further boost to tourism and so did John Ruskin, artist, writer, critic, teacher and philosopher, who bought and lived in Brantwood House on the eastern side of Coniston Water from 1872 until his death in 1900 is buried in Coniston village churchyard of St Andrews. The museum in Coniston village is dedicated to Ruskin and also covers the history and heritage of Coniston Water and the Lake District. Arthur Ransom, novelist, gained much of his inspiration for his children’s novel ‘Swallows and Amazons’ from Coniston Water. The water has become known for a controversial murder case. Mrs Carol Park was dubbed the ‘Lady in the Lake’ after the Raymond Chandler novel of the same name. Coniston Water at five miles long and half a mile wide is the third largest lake in the Lake District and is an example of a ribbon lake formed by glaciations during the last ice age and drains into the sea via the River Crake. In the 13th and 14th centuries Coniston Water was an important source of fish for the monks of Furness Abbey who owned the lake and much of the surrounding land. In the 20th century Coniston Water was the scene of many attempts to break the world water speed record. On the 19th August 1939 Sir Malcolm Campbell set the record at 141.74 miles per hour in Bluebird K4. His son Donald Campbell set four successive records on the lake in Bluebird K7, a hydroplane, between 1956 and 1959. It was on the 4th January 1967 that Donald Campbell achieved a top speed of 320 miles per hour in Bluebird K7 on the return leg of a record breaking attempt but he lost control of Bluebird which somersaulted and crashed sinking very quickly killing him instantly on impact. The attempt could not be counted as a record breaking run because the second leg was not completed. Bluebird was recovered from Coniston Water on 8th March 2001 and the remains of Donald Campbell’s body were brought up on 28th May. A memorial service was held on the 12th September and his body buried in the churchyard. Coniston Water is ideal for kayaking and canoeing as there are a number of good sites for launching and recovery. Boats of various sizes can be hired from the lake side near the steam yacht and the water-speed limit is 10 mph except for boats attempting new world water-speed records during Records Week which is normally held in the first week of November. The lake is paddled as the second leg of the Three Lakes Challenge. The steam yacht ‘Gondola’ along with two smaller motorised launches tour the lake in the summer months. The climb from the village starts with a very steep metalled road leading to a car park which is also used as a starting point providing a good head start. The summit is marked with a combined slate platform and cairn and on a clear day the view extends too much of the southern Lake District, Morecambe Bay, Blackpool Tower, Winter Hill, the Lancashire coast and the Isle of Man. The sheep that roam freely are quite tame and think nothing of eating any remains of food left by the visitors. The Old Man has seen extensive slate mining activity for 800 years and the remains of abandoned mines and spoil tips are evident everywhere. The southern and eastern sides of The Old Man are of rough ground deeply scared by slate quarries. One of the quarries still operating is Bursting Stone and produces an olive green slate. Walna Scar Road which runs along the southern slopes of The Old Man was the original trade route between Coniston village and the settlements of the Duddon Valley and is now a public restricted byway. Goats Water, containing trout and char, is an elongated and deep tarn lying in a deep trench on the west side of The Old Man. It is enclosed by the surrounding high ground and flows out southwards through a field of boulders, over a waterfall into Torver Beck which then flows into Coniston Water. Low Water is a corrie tarn that has been dammed in the past to provide water for the quarries. The tarn sits beneath the northern face of The Old Man and its waters now flow via a waterfall into the Coppermines Valley which is heavily scared from mining. We park in the car parking area at the end of Station Road. We head forwards on the track signposted Walna Scar Road. We eventually cross over a stream and at the two posts we turn right following the track and scrambling over some rocks to Goats Water. We walk to the right hand side of the tarn scrambling over some more rocks until we reach the other end. We now climb very steeply uphill to the top then turn right. We keep following the track for about 5 minutes then bear right following the path to the summit of The Old Man. We then bear left steeply downhill towards Low Water we can see below down on our left. About half way along Low Water we turn right and follow the track through the disused mine workings towards Coniston Water we can see in the distance. At the end of the mine workings we turn right and follow the track returning to the car park we can see in the distance. This is a hard walk on good paths and tracks with steep inclines and declines. Approx 5 miles allow 3 to 4 hours using OS Explorer Map OL6, The English Lakes South-western area. Start point: Free car parking area at the top of Station Road, no through road. Coniston is in the southern area of the Lake District, Cumbria. From the A66 at Threlkeld take the B5322 on the left. At the t-junction at Legburthwaite turn left onto the A591 by the side of Thirlmere. At Ambleside take A593 following the signs for Coniston. Just before leaving Coniston turn right into Station Road, no through road, and follow the single track road uphill to the end and the car parking area. Parking: Pay and Display car park in the village and at the sailing club. For walkers only there is a free car parking area at the end of Station Road. There are public toilets situated next to the Tourist Information Centre in the village car park. For refreshments there are a number of shops, cafes, restaurants and four pubs.